www.lynnlum.com: Bring It On, my Gingerboy! Jin Loong is in town!!! That rich kid is coming over for the Melbourne Grand Prix. Not only that, he will then fly back to KL again to watch the Sepang Grand Prix, pffft... I'm so jealous. Well, as one said, if a person can fly back to Melbourne for Summadayze, why can't another fly back to KL for Grand Prix. Right! One great thing that Jin and I have in common is that we both love dining in beautiful restaurants that serve yummy food. We're willing to pay as long as the package is good - good food, good service, good ambiance. We've got both lunch and dinner sorted out for Friday, and we're going to my favourite restaurant in Melbourne for dinner on Friday *jumping up and down* I've decided not to go Alice McCall, Zimmermann and True Religion warehouse sales this weekend, because I would rather spend them on food. Tonight, we explored Gingerboy, chef Teague Ezard's new baby, an asian fusion restaurant, which the premise was previously occupied by Madam Fang. I wasn't too surprise to have arrived at this crampy restaurant where each and every table was taken by the devoted foodie on a Wednesday evening. We waited at the small but chic bar for about half an hour before we could get a table but really, we didn't mind. The place is enormously stylish despite the limited space. Just found out that it was designed by the same architects at Vue De Monde, lovely! Mr Ezard had done his job so well, I was very impressed by the fact that my sky-high expectations were met. If you ask me, I would say I enjoyed tonight's dinner more than at Ezard. Well, I'm not saying the latter wasn't good but he has really done an absolutely great job tonight. 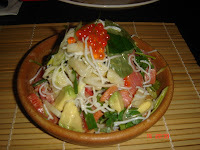 We started with 'smoked trout and avocado salad, betel leaves, coconut dressing' which tasted a little like the yee sang (low hei). It was so yummy that I had to use my spoon to scoop every single drop of dressing left on the small little plate. Two different fishes were ordered for main (uhh... so healthy!) 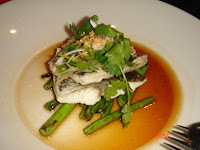 - 'whole fried snapper, roasted chilli dressing, lychee salad' and 'steamed sea bass, asparagus, soy and ginger dressing'. Let me tell you, the soy and ginger dressing that came in an extra bowl was extremely delicious. It tasted slightly like the tempura sauce but 10 times better! Jin and I basically showered our rice with that, hmm... yummm! I'm missing it. 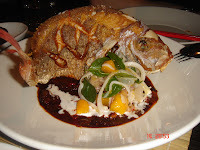 The fried snapper was great as it was crunchy on the outside and tender in the inside, and the dressing with lychee salad was a good balance between sweet and sour. Well done! 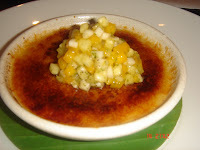 Last but not least, and the best of all was the 'lemongrass and lime creme brulee with tropical fruit salsa'. My goodness, it was one of the best creme brulee I've ever had. I would say that it is on par with the ones at France Soir, yes, it was THAT good! Sensational. Jin had also ordered this 'Gingerboy chilli condiment' where I've learned that sambal is sometimes called the "chilli jam" here, cute! Milyn, if you're reading this, let's go next week, I need to try the other stuff on their menu. Guess this will be my new weekdays-casual-dining-room. Besides Gingerboy, I was and will be trying to take Jin to as many bars as possible for these coming few nights, understanding that he will has to be in bed early for the race on Friday and Saturday night. I've took him to Riverland, Madame Brussel and St. Jerome tonight as I thought we should take the opportunity of this great warm weather to be at outdoor. Looking forward to our lunch with lotsa sunshine below my place and thank you for dinner tonight. I've god a bad feeling of losing my waist again over the weekend. Guess I just can't have my cake and eat it, can I? Food in Melb is absolute bliss. I love the food at Flower Drum and Bok Choy gives them a pretty good run for their money (at a 1/3 of the price too), Koko's always yummy and France Soir's is brilliant. xox have a good weekend babe! You're so right sweet. All of the above are great, but the best will always be... Vue De Monde!!! 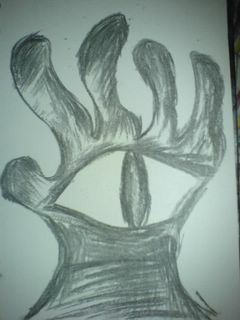 Boooohhooooo!! !